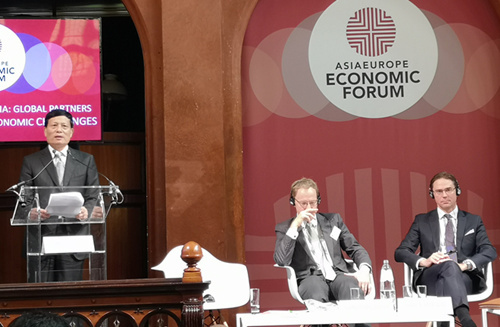 Brussels—Under the theme “Europe and Asia: Global Partners for Global Economic Challenges,” the 15th Asia Europe Economic Forum (AEEF) took place Oct. 17–18 in conjunction with the 12th ASEM Summit, which took place Oct. 18–19 in Brussels, Belgium. The AEEF serves as a high level platform, giving Asian and European policy makers and economic experts an occasion for in-depth research-based exchanges on global issues. In his keynote speech at the AEEF, Xie Fuzhan, president of the Chinese Academy of Social Sciences, said that the world economy is now in its best period since the international financial crisis, but potential risks are accumulating. The problems in the economic field are extending to the social, political and security areas, endangering world peace, development and stability. At present, the factors supporting long-term economic growth are not stable, the risks facing global economic stability are rising, income inequality has not been effectively addressed, and the multilateral system and international economic rules have been undermined, Xie said. The economic prosperity and stability of Asia and Europe are the cornerstone of the prosperity and stability of the world economy, Xie continued. Asian and European countries are also important forces for maintaining world peace and development. Xie explained that we need to strengthen technical cooperation and explore a more inclusive innovation system and likewise strengthen policy dialogues and establish a more effective coordination mechanism. We must adhere to the multilateral framework while improving and maintaining more authoritative international economic rules. Chinese President Xi Jinping proposed the “Belt and Road” (B&R) Initiative five years ago. Guided by the principle of extensive consultation, joint contribution, shared benefits and connectivity, the B&R is committed to promoting the alignment of development strategies and complementary advantages of countries along the routes, thus creating a platform for multidimensional cooperation to achieve mutual benefit and shared development, Xie said. The EU’s vision of connecting Europe and Asia is highly consistent with China’s B&R, and the two can fully achieve strategic docking. Xie added that as long as we promote open and inclusive cooperation for mutual benefit, the strategy of Connecting Europe and Asia and the B&R will align and become an important platform for Asia-Europe cooperation to meet global challenges. With the increasingly close economic relations between Europe and Asia, strengthening cooperation between the two is of great significance, said Jyrki Katainen, vice president of the European Commission. The European Union has a very positive attitude towards the B&R and hopes to strengthen cooperation between Europe and Asia in infrastructure, transportation, energy and information technology to enhance the interconnection between and the sustainable development of Europe and Asia. Katainen said that trade openness plays a vital role in many respects, including the modernization of European economic development, the guarantee of social welfare and the practice of European values and rules. At present, in some countries of the world, unilateralism and protectionism have risen, which will damage world economic growth and the interests of all parties. At present, the WTO is still the cornerstone of the world trade system, but as the world economy changes, the WTO needs to adjust to the new situation, Katainen said, adding that the European Union is willing to work with partners to promote WTO reform. China has been deeply integrated into the world economic system, Xie said. Over the past four decades of reform and opening up, China’s economy has continued to grow rapidly, industrialization and urbanization have steadily advanced, the reform of market-oriented institutional mechanisms has continued to deepen, rule of law has been facilitated, poverty has been alleviated, and ecological progress has been made. China has become an important engine for world economic growth and an important force for maintaining world peace and stability and promoting globalization. China will unswervingly continue to promote the comprehensive deepening of reforms and all-round opening up, and it will work with other Asian and European countries to jointly address global challenges and promote world peace, development, prosperity and stability, Xie concluded.